"What is DVD-RW, DVD-ROM, CD-ROM, and CD-RW drives?" If you are not sure what is DVD-RW or any other media drives, I hope that this tutorial can solve your question. But basically all those drives are use to read the data contains in different types of CDs. CD-ROM (Compact Disk Read-Only Memory) is a drive which reads aluminum-coated round plastic discs. The CD-ROM disc is 12 x 12 cm with a width of 0.1cm. The disc is made of a polycarbonate wafer and is coated with a metallic film, usually an aluminum alloy. The 'x' on the CD-ROM drive speed signifies the transfer rate of 150 kbps (kilobytes per second). Normally, the front panel of the CD-ROM drive stated the speed of the CD-ROM such as 52x. This speed signifies the maximum speed of the CD-ROM is 52 times 150 kbps = 7800 kbps; means in one second the CD-ROM can transfer data up to 7800 kilobytes. By the way, the ROM part of CD-ROM means that you can only read data from the disk; unlike normal hard disks and diskettes, you can't write new data to a standard CD-ROM. However, the CD-RW drives are available that do let you write data to CD discs. CD-RW (Compact Disk ReWritable) drives not only have capabilities to read the data on the CDs but also can write the data to the disc, i.e. CD-R or CD-RW with different reading and writing speed. For example, 52x32x52x on the CD-RW drive indicates write to the CD-R disc is 52x, write to the CD-RW disc is 32x and read from the CD-ROM drive is 52x. 1x in CD-RW drive signifies the transfer rate of 150 kbps (same as CD-ROM). As the technology evolutions, the CD-ROM and CD-RW drives is going to obsolete as being replaces by DVD-RW drives. 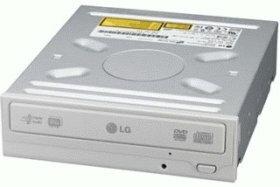 The layout CD-ROM / CD-RW / DVD-ROM / DVD-RW drives are more or less same. To differentiate between them, look at the front panel of the drives. Normally, the manufacturers stated will clear the type of the drive at the front panel. DVD-ROM (Digital Versatile Disc Read-Only Memory) drives fit into the same PC drives bays as CD-ROM or CD-RW drives. The difference between them is that the 'x' in a CD-ROM / CD-RW drive's speed signifies the transfer rate of 150 kbps, whereas the 'x' in a DVD-ROM drive's speed equals roughly 1.4 megabytes per second (Mbps). Therefore, a 1x DVD-ROM drive's run faster than an 8x CD-ROM drive. DVD-RW (Digital Versatile Disc ReWritable) drives not only have capabilities to read the data on the CDs and DVDs but also can write the data to the disc, i.e. CD-R, CD-RW, DVD+R, DVD-R, DVD+RW, and DVD-RW. The 'x' in a DVD-ROM /DVD-RW drive's speed equals roughly 1.4 megabytes per second. These CD-ROM drives connect to an IDE socket on the Main board. Usually, the jumper on the hard disk drive is set as master and the CD-ROM drive is set to slave. The latest CD/DVD drives are based on SATA interface. The data transfer rate of the SATA interface is faster than IDE interface. These require a SCSI Host adapter card connected into the system. These cards required PCI bus cards plug to the motherboard PCI Slot. It is highly recommended to get a card that matches the CD-ROM drive as some of the earlier drives had proprietary SCSI interfaces. With CD-R, you can write data to it once only. Once the drive is written to it cannot be erased. A CD-R is a special type of CD, which is coated with a photosensitive organic dye which allows a user to record information for backup and duplication purposes. With a CD-R you can browse the CD and choose individual or multiple files and restore them immediately. Nowadays, the normal CD-R can hold data up to 700 MB. The CD-R disks will be able to be used in any standard CD-ROM, CD-RW or DVD-ROM drive. CD-RW has the capability of being written to at least one thousand times. Unlike the CD-R technology which uses a photosensitive dye, CD-RW disks uses an active layer of Ag-In-Sb-Te (silver-indium-antimony-tellurium) alloy that, in its original state, has a polycrystalline structure that makes it reflective. Also, the CD-RW disks will be able to be used in any standard CD-ROM, CD-RW or DVD-ROM drive. A new standard released which originally was called Digital Video Disc. DVD offers an initial storage capacity of 4.7GB (of digital information on a single-sided, single-layer disc, the same diameter and thickness of a current normal CD). DVD-R and DVD+R is a non-rewriteable disc format means that the content of the disc cannot be erase once it's written. DVD-RW and DVD+RW is a rewriteable format (disc contents can be erase) and it is compatible with DVD drives.